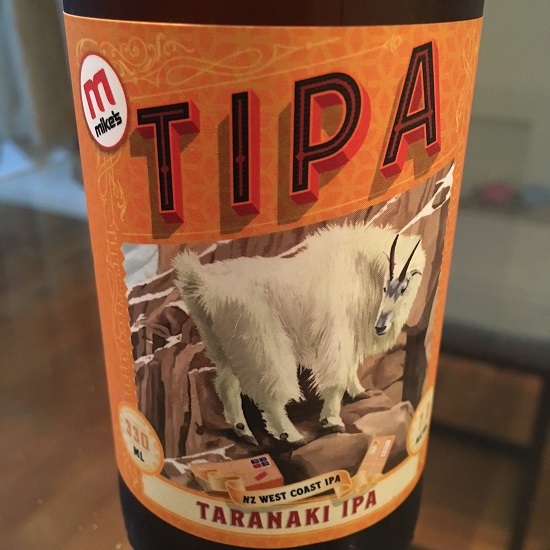 This bottle of Mike’s Taranaki IPA has been rolling around the bottom of my fridge for nearly three months now, waiting for the perfect time to drink it. Blurb on the bottle: Taranaki IPA was first brewed as a collaboration back in 2011. It’s evolved a fair bit over the years, but remains true to the original aim of creating a big, balanced, hoppy IPA that doesn’t dry out on you. Truck-loads of our distinctive New Zealand hops are tempered by the generous malt cushion and influenced by the warming alcohol. The aroma and flavour resemble a tropical, citrus fruit salad with a big resinous finish. The result is as tenacious and well balanced as a high-altitude, alpine mountain goat. The review: I like the art on the beer label, so I opted to drink this beer straight from the bottle, rather than a glass. Wanky craft beer aficionados will tell you that’s not the way to do it, and they’d be right, but stuff ‘em. This beer smacks of sour grapefruit and sweet sherbet, resinous hops and caramel malt. It is reasonably well balanced for an IPA of this calibre (7% ABV) but it still packs a punch; I’m not sure I could have a second one and still be able to operate this laptop very effectively. The verdict: Mike’s Taranaki IPA is choice. Enough said. Movie/beer combination: Is there even anything on at the cinema right now besides Avengers: Infinity War?